IS YOUR AGENCY ITS BEST POSSIBLE VERSION? - The Rough Notes Company Inc.
IS YOUR AGENCY ITS BEST POSSIBLE VERSION? At one of our CEO programs earlier this year, Brent Kelly, our vice president, asked me what it takes for an agency to be the best it can be. But it was what he asked me next that changed how we approach everything we do and has become the catalyst for massive, rapid improvements for everyone who attends our life-changing events, including our CEO, Sales Leadership, Producer, and Account Manager programs. This is important for agency owners, of course. But I also believe it’s something all of us as individuals should be asking ourselves. I can tell you it’s had a major impact on me personally, as well as everyone we’ve shared it with. It’s been absolutely amazing to see the immediate improvements our Sitkins Network leaders and producers have begun to make simply by focusing on their best possible version! I believe too many agency leaders and producers sell themselves short and never truly maximize their potential. All too often they are caught up in the business of being busy, dealing with countless day-to-day frustrations and obstacles that prevent them from growing. 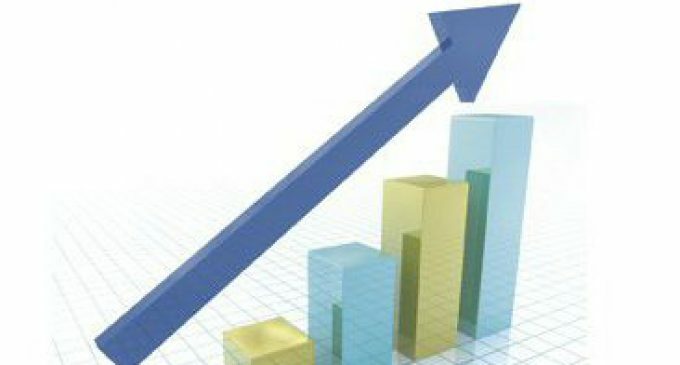 Growth: Why can’t I grow any faster than I am? Ease of Doing Business: It sure used to be less complicated! Overwhelmed with Data and Information: TMI! Carrier Demands: Carriers all want more of the same stuff, which makes it impossible to satisfy them all. Staffing: How do I attract the best and the brightest? Adjusting to the New Owners: They sure do want to buy differently! Accountability: Getting people to actually do what they said they were going to do. Do any of these hit home with you? If so, you might want to make a note of it. In life, in our careers, and in our businesses, we can either take the easy way out or the hard way in. We have found that most people will consistently take the easy way out. They refuse to do the harder things now that will have a tremendously positive impact on their future. For too many people, good is good enough! To illustrate the point, imagine a circle—the EZ Circle (we spell it that way to help make it more memorable)—inside a square that represents the Hard Box. 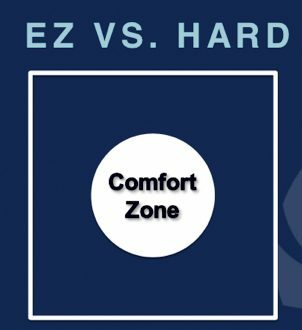 The EZ Circle represents your comfort zone, while the Hard Box represents the things most agencies ignore. Ignoring the power of the 80/20 rule, thereby allowing profitable producers and accounts to subsidize unprofitable ones. As an industry, we are mass producing average agencies that take the “good is good enough” approach to getting results. Average agencies rarely if ever leave the EZ Circle. Hard Box—Conversely, the very best agencies understand that all growth starts at the outer edges of our comfort zone. They’re willing to breach the edges of their EZ Circle to get great results. They focus their efforts on the Hard Box now, so they can become BPVs and have an easier and more successful life later. Holding effective sales meetings and selling skills practice. Drawing a distinct line between sales and service activities is one of the hardest things to do. Another is getting producers out of the office and following our Producer’s Perfect Schedule. This approach to time management allows them to have 10 appointments per week with Clients, Future Ideal Clients and Centers of Influence, which dramatically improves their TSS (Time Spent Selling). Version 1.0 does 25% of the hard things and gets consistently poor results. Going forward, this version is virtually guaranteed to produce regrets. Version 2.0 is an average agency that does between 25% and 50% of what it should be doing. While it’s getting average results, it’s also starting to reduce regrets. Version 3.0 does 50% to 75% of what it should be doing to get satisfactory results. Good is good enough; they don’t want to go any further. Version 4.0 has reached top tier status. This rare agency does 75% to 100% of the hard stuff the vast majority of the time. Because of that, it produces outstanding results and has absolutely no regrets. I consider Good to Great to be among the best business books ever. It contains one of the most quoted lines of our time: “Good is the enemy of great.” Similarly, it occurs to me that “good is good enough” is the enemy of becoming the Best Possible Version of your agency! Here’s why: Believing that good is good enough will get you three quarters of the way there and no further. At that point, you stop! Another of my all-time favorite quotes is: “You don’t choose your future; you choose your habits (e.g., behaviors and strategies). Your habits choose your future!” In other words, it’s not about just looking at numbers to see if you’re the BPV. It’s about identifying and executing the BPV behaviors and strategies that become normal in an agency; the numbers are merely the outcome of that. Success becomes predictable and in fact guaranteed only when you consistently choose the behaviors and strategies that enable it. We wholeheartedly believe that agencies have a responsibility to provide the tools and training their producers and other team members need to succeed. We also believe that these team members are responsible for executing the behaviors and strategies that result in success. Are you ready to live a life of no regrets and stop postponing your success? If so, here are a couple of things to keep in mind: (1) nothing changes if nothing changes, and (2) hope is not a strategy! Your BPV is out there waiting for you. Don’t you owe it to your agency to discover it? Roger Sitkins, CEO of Sitkins Group, Inc., developed The Sitkins Network and The Better Way Agency program. Insurance professionals with diverse levels of experience have benefitted tremendously from his training and leadership. Roger was inducted into the Michigan Insurance Hall of Fame in 2017 and in that same year also received the Dr. Henry C. Martin Award from Rough Notes magazine. 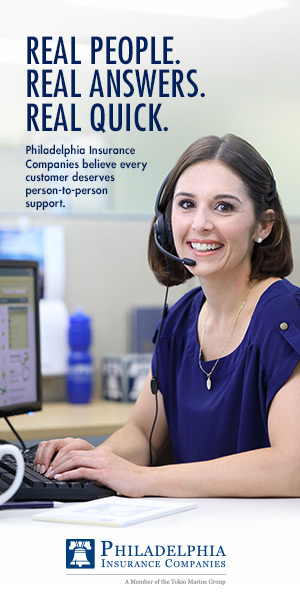 He is known throughout the industry as the nation’s top insurance agency results coach. 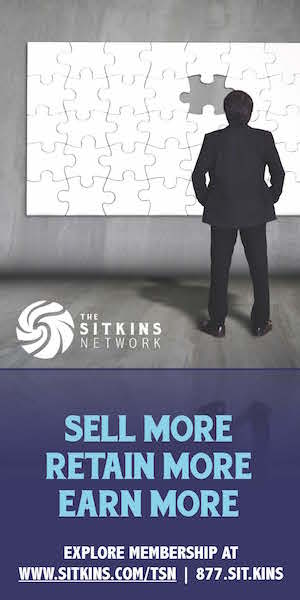 To learn more, visit www.sitkins.com.